In 1965, five uniquely talented artists from a variety of musical backgrounds came together to form a new kind of band. Guitarist Bob Weir, drummer Bill Kreutzmann and Ron "Pigpen" McKernan all served stints in various Bay Area rock and R&B outfits; Jerry Garcia played guitar and banjo in a jug band and bassist Phil Lesh was a composer of electronic music. The Grateful Dead's first album was released in 1967. It was followed by Anthem of the Sun (1968), Aoxomoxoa (1969) and the double live album Live Dead (1970). All three were aimed at capturing the Grateful Dead concert experience on record. 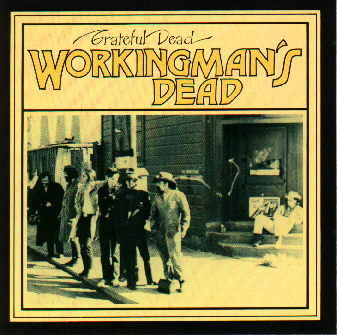 With the release of Workingman's Dead in late 1970, the group made a sharp stylistic shift. Produced by Bob Matthews, Betty Cantor and the band, the album features eight original songs written by Garcia and lyricist Robert Hunter. The material reflects clear country, blues and folk influences; the arrangements are sharp and concise; the performances lilting and subtle. Workingman's Dead earned the Grateful Dead a whole new following. Containing their first radio hit, "Uncle John's Band," the album also features some of the best known and most enduring songs in the band's repertoire. "Casey Jones," "Dire Wolf," "Cumberland Blues" (with guest guitarist David Nelson of New Riders Of The Purple Sage) and "Black Peter" all revealed new facets of the band's American musical roots. Special thanks to John Dawson. Special thanks to David Nelson - acoustic guitar on "Cumberland Blues"
Workingman's Dead was released on June 26, 1970.